In 1892, on the 400th anniversary of Columbus voyage of discovery, Columbian School was named in his honor and built on pasture land in the midst of dairy farms on the corner of Grove Street and Springdale Avenue. Construction in 1902 expanded the building to its present size. George Washington Carver (formerly Columbian) School photographed in 2008. It has changed very little since the 1920's. Postcard Photo of Columbian, taken prior to 1913 when the below-mentioned addition was built. Meeting the demand for school facilities in the northeastern part of the town, known as Ampere, the Board of Education laid out a new district in 1892, which extended from William street on the south, north by the Parkway to Park avenue, west to Clinton street, north to the Bloomfield line and east to the Newark line. The country was celebrating the 400th anniversary of the discovery of America by Christopher Columbus, and in his honor the building was named Columbian. 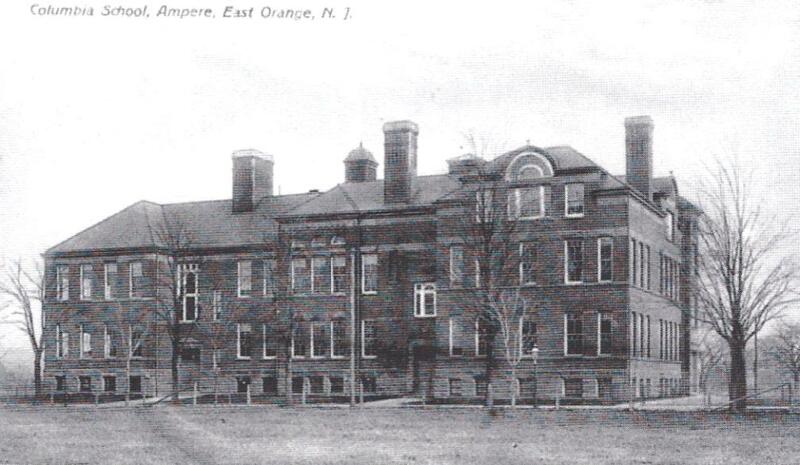 It was built at the corner of Grove street and Springdale avenue, and was first occupied in the spring of 1893. There were eight rooms in the building. The plot measured 100 feet on the latter thoroughfare, 390 feet on the southerly side and 200 feet on Grove street. Dairy farms surrounded the school and only three houses were standing north of Springdale avenue. A pasture land extended southerly, including land between Fourth avenue and Nineteenth street, and open fields stretched westerly to Arlington avenue. Completed at a cost of $30,000, the building was used by the kindergarten, first, second and third grades. One hundred pupils were enrolled on the opening day. But the population was increasing and in 1897, the first eighth grade class, consisting of sixteen pupils, was graduated to the High School. Then it became necessary to transfer the seventh and eighth grades to the Eastern School till 1902, when the school was again given the grammar standing. A portable building was used in 1912 for primary classes till the new addition on the southeast corner was occupied, and in April, 1913, three class rooms and the principal's office were completed on the first floor. Frank S. Coe has been the only principal since the school was organized. A custom established at the graduation to present a gift to the school, has added greatly to the collection of works of art. The value of the plant in 1920 is $210,050.25. Columbian School was renamed George Washington Carver Institute at the turn of this current century. The school has been vacant since 2006 when all the students were moved to Glenwood Campus after the original Carver building was found to have a severe mold problem. On 2/1/14 it was announced that state funds would be received to reconstruct Carver Elementary School. It is a pleasure to announce that the East Orange School District won approval for the design and construction of the New GEORGE WASHINGTON CARVER INSTITUTE on the grounds of the former Columbian School located on the corner of Springdale Avenue and Grove Street. The New George Washington Carver facility will be designed to educate approximately 500 students in pre-kindergarten through eighth grades. The School Development Authority (SDA) anticipates completion of the new school by the Summer of 2020. 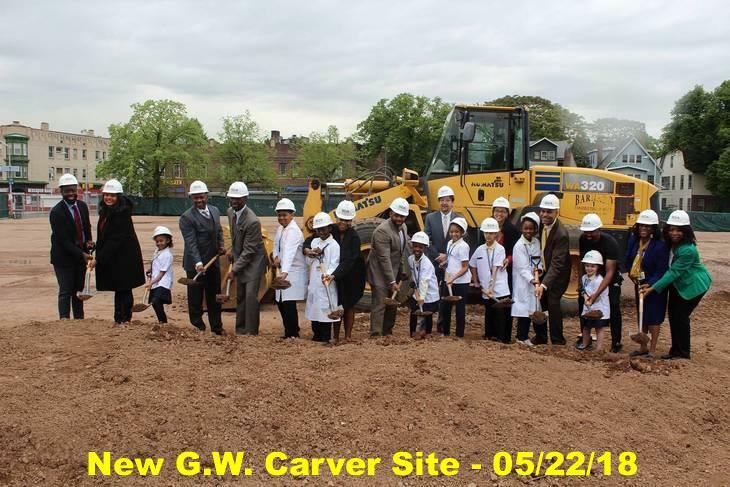 It is our belief that this project will provide a safe learning environment for the children of Carver Institute. We look forward to working with the SDA to accelerate the process. Notice that the East Orange School District felt free to use my 2008 photograph without crediting it, instead of taking a photo of their own! Groundbreaking ceremony at George Washington Carver Institute of Science and Technology, formerly known as Columbian School, on North Grove Street. The new 77,000 square-foot state-of-the-art facility being built by New Jersey's Schools Development Authority will provide space to educate 470 students in grades PreK-5. Total estimated project cost is $41.2M and anticipated date of completion is 2020. 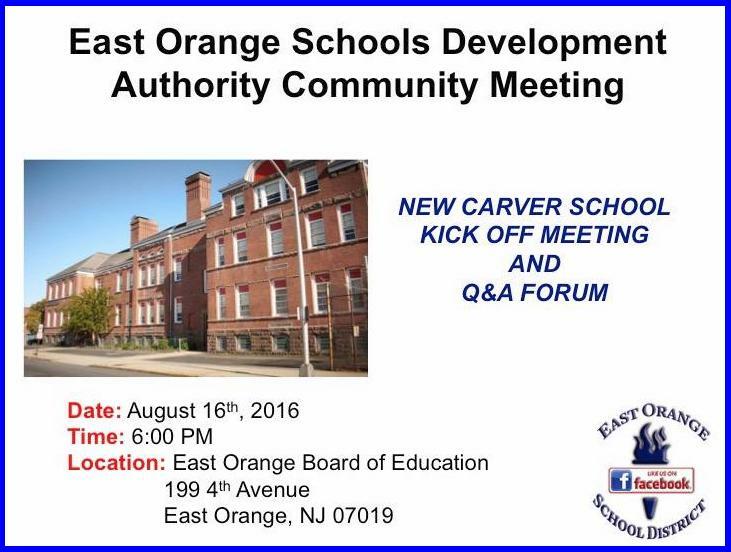 More Photos from the East Orange City Facebook Page. Columbian School, East Orange, NJ. The above 1955 photo was sent to us by Mr. Gregory R. Le Cerff, currently of Hamilton, NJ. Amazingly (to me) he has remembered the name of each student shown, with one exception. Left to Right, First Row: Harvey Berkowitz, John Mazzuto, Richard Walker, Christine Bercale, Jeanette Russo, Judy Rubenstein, Patty Awnmuller, Greg Le Cerff, Mrs. Veitch. Second Row: Marina Karis, Teddy Lindberg, Tommy Johnson, Vincent Nappliello, Virginia Kowl, Lois Green, Larry Bunn, Peter ----, Patsy Geonnetta, Joe McCabe, Jack Gardiner. There were two additional students in the class not pictured; Michael Petrone and Gregory Kimbrough. In the background is a picture of the class' trip to the Newark Museum. The above photo, sent in by Barbara Bogue McAulay 10/25/14, who attended Columbian Elementary School from 1941 to 1944, was taken just after the bombing of Pearl Harbor and the United States' entry into World War II. The desks were arranged as a letter "V" for Victory and this was called a "Victory Photo" by the School Projects Photo Company of Orange, NJ, who apparently made a project of assisting the war effort by taking and selling these photos. 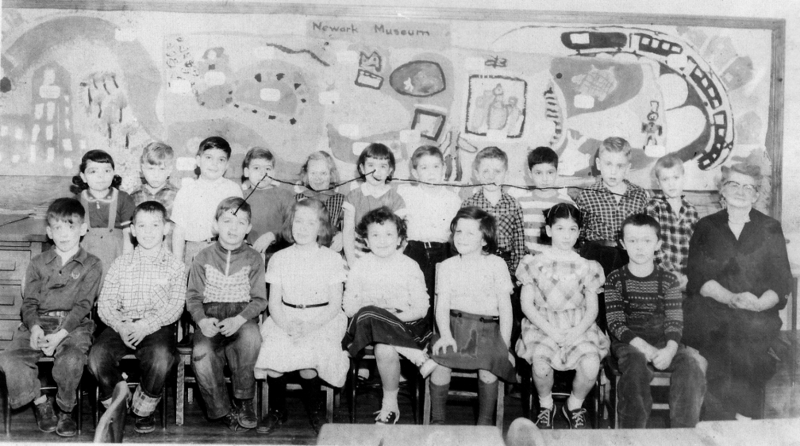 Young Barbara Bogue, as she was called then, can be seen on the top far left between the two boys in striped shirts. The girl at the bottom right was her friend Barbara Mather. If anyone can identify any of the others, please let me know. Click HERE to see the 1938 Yearbook.